Multi-instrumentalist, composer and producer Michael McGoldrick has been a member of several influential bands. In 1994 he was awarded the BBC Young Tradition Award, and in 2001 he was given the Instrumentalist of the Year award at the BBC Radio 2 Folk Awards. Michael was a founder-member of the Celtic rock band Toss the Feathers while still at school with Dezi Donnelly. He formed the band Fluke! (later renamed as Flook) with Brian Finnegan and Sarah Allen in November 1995. He was an early member of Lúnasa from 1997 until roughly 2000 and played on their first albums. He also joined Capercaillie in 1997, playing on six albums (one live) up to date. 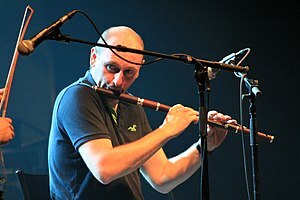 McGoldrick has played regularly for Afro-Celt Sound System and Kate Rusby's band. As of 2018 he leads the Michael McGoldrick Band. He has recorded Five solo albums: Morning Rory showcases his traditional skills. Fused explores several other musical genres including jazz, while Wired, released in October 2005, takes the experimental approach of Fused even further. Aurora, released in 2010, And his latest release Arc 2018 He also recorded an album, At First Light, with John McSherry (also ex-Lúnasa) going back to his traditional roots. Between 2007 and 2013 McGoldrick played with the house band for the Transatlantic Sessions (Sessions 3-6) including performing some of his own compositions/arrangements. This class is open to proficient musicians, who are well able to play reels and jigs by ear. Places in these classes are limited and booking is essential. Thank you to Mayo Music Generation for their help in making this Master Class possible. ​Dezi 'Fiddle on Fire' Donnelly is a Manchester based Fiddle player. One of the founder members of the legendary Celtic Rock Band 'Toss the Feathers'. Often seen collaborating with the likes of Sharon Shannon and BBC instrumentalist of the Year Mike McGoldrick.
" As an interpreter of traditional music, Dezi Donnelly stands apart from others of his generation. Despite his young age his playing bears all the hallmarks of someone who has grown naturally with the music." - Paddy Glackin - from the liner notes of Familiar Footsteps. It is a well known cliché, to describe a fiddle player as "a devil fiddler" but in Dezi Donnelly's case this is more of an understatement! The sibling of a Manchester fiddler dynasty is both All Britain and All Ireland Champion, a title truly deserved for his brilliant jigs and reels. It was during this period (in 1989 to be precise) that Dezi recorded some tracks with Mancunian flutist Michael McGoldrick. Mike's flute and Dezi's fiddle gently spar on most of the tracks, however each take the lead when required and the arrangements allow them to swap leads within sets to great effect. The tracks were later released on the album, "Champions Of The North", and Dezi also featured on Mike's amazing "Fused" album. He also played on McGoldricks 'Wired' and the latest release 'Aurora'. In 2009 Dezi was asked to appear on the BBC's 'Transatlantic Sessions' and performed alongside Jerry Douglas, Ali Bain, Phil Cunningham, Donal Lunny and James Taylor. ​Thank you to Mayo Music Generation for their help in making this Master Class possible. The Master Class will focus on advanced players only and is open to all instruments. Multi-instrumentalist, Stephen Doherty will guide participants through all aspects of group and stage performance with a focus on arrangement, technique composition etc. 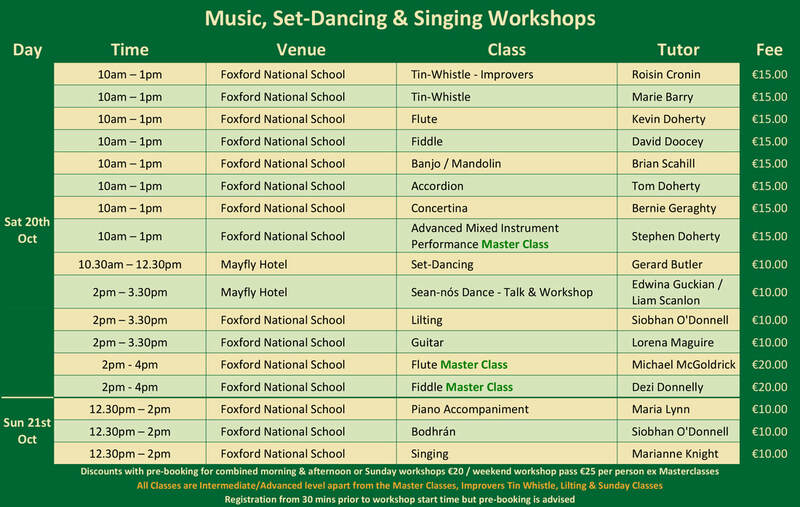 This Master Class takes place in Foxford National School on Sat 20th Oct from 10am - 1pm. Participants in this class will be asked to perform the arranged musical piece from the workshop, at the Féile concert in the Mayfly Hotel on Sat night. Michael McGoldrick and Dezi Donnelly Masterclasses €20 each. These masterclasses are open to proficient musicians, who are well able to play/learn reels and jigs by ear. Workshops €15 each. Discounts with pre-booking for combined morning & afternoon or Sunday workshops €20 / weekend workshop pass €25 per person ex Masterclasses. All Classes are Intermediate/Advanced level apart from the Master Classes, Improvers Tin Whistle & Sunday Classes. Registration from 30 mins prior to workshop start time but pre-booking is advised on the form below or by text to 086 3999774. To ensure things run efficiently and to give everyone who comes to the workshops and masterclasses the best opportunity we would like to confirm that all Classes are Intermediate/Advanced level apart from the Master Classes, Improvers Tin Whistle, Lilting & Sunday Classes. Masterclasses are open to proficient musicians, who are well able to play/learn reels and jigs by ear.